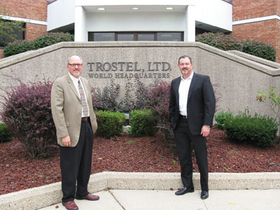 Trostel executives Greg Vassmer (left) and Steven Dyer pose outside of the firm's headquarters in Lake Geneva, Wis.
LAKE GENEVA, Wis.—Trostel Ltd. is expanding all facets of its business with a series of projects that will impact both its rubber molding and compounding operations. The company is building an addition onto its headquarters facility in Lake Geneva that will bring some manufacturing to the site; it just completed a building expansion at its Whitewater, Wis., compounding division that will allow for the addition of new capital equipment; and it is upgrading equipment and focusing on lean manufacturing efforts at its molding factory in Reynosa, Mexico. Trostel didn't put a price tag on the investments required for all of the projects, but President and CEO Steven Dyer said the expansion at the Lake Geneva unit will run a "few million dollars." At that site, the company is adding 30,000 square feet of high bay manufacturing space and renovating the office area. When completed by the end of March, Lake Geneva will serve as Trostel's global headquarters and also host research and development, launch preparation, prototype manufacturing and some production, said Greg Vassmer, chief technology and quality officer. "This is built to reflect this being our world headquarters and our innovation center," Dyer said. "It will have our material analysis lab and our material testing capabilities. We can put the product in its applications and test various forces, functionality and environmental constraints to be able to take that data back to the customer to say this is what the data says about the selection and design we have chosen." The production area will have compression, injection and transfer presses, Vassmer said. Right now, most of the presses on-site are prototype size, but once the addition is completed, larger tonnage presses will be added. "Our overall vision is to prototype, trial and launch programs here," Dyer said, "and then we can deploy that process wherever around the globe that is optimum for our customers." Vassmer said one of the thoughts behind having some manufacturing at Lake Geneva was to allow engineers to see firsthand the problems of manufacturing. "They won't just be putting theoretical processes in place," he said. "They will actually be working on something that they are able to try out and see how it works." Trostel has been sending engineers out frequently to the plants to see what they just designed, according to Vassmer, because "it never seems like it runs like it did when prototyping." "The goal isn't for this to be a huge manufacturing facility," he said. "It's going to be a place where we figure out how to manufacture things. We will keep manufacturing things here that give us some value and give the customers some value." Dyer said one customer will be sourcing product there to promote "Made in the USA" processes. "I'm not sure whether that is driven by the marketing and branding group, or if it's an internal drive and desire," he said. "But the economics have to make sense. If the economics don't make sense, they wouldn't do this." Trostel already has added a new chemist and plans to add 20 employees in Lake Geneva by the end of next year. "The new facility will help our team develop even more innovative ideas and solutions to address the challenges our customers face," Dyer said. The company produces precision seals and custom molded rubber products for the appliance, automotive and general industrial markets. Trostel also is a compounder of proprietary elastomer mixes. It just finished a 10,000-sq.-ft. addition at the Whitewater facility that it said will allow for more equipment, improve material flow and also boost efficiency and safety. With growth in the compounding division in recent years, Dyer said Trostel now has more recipes that require more raw materials, and the unit needed more space to eliminate congestion issues and give the business a proper environment in which to operate. "This was a necessary investment for our organization to prepare us for the next level of growth in that business," he said. The unit currently has a large mixer for production batches along with a smaller mixer for prototyping and smaller batches. The company still is deciding in what form it will add new capacity, be it in a new large mixer or multiple smaller ones that give more flexibility. "We as a team are evaluating those opportunities to see where we create the most value and where that is," Dyer said. "Our ability to add value there is in consistency of mix and dispersion of very difficult mixes; mixes that have a very tight specification or tolerance range due to the application; and in developing applications that live in extreme environments." A good deal of the mixing goes for Trostel's molding operation, which ranks as the sixth largest customer for the compounding business. "It's a substantial part of our business, but we're still much larger on our custom mix outside than captive." Dyer said the molding unit rarely comes up against customers of the mixing business in the marketplace. "We don't seem to bump into them a lot in the quoting realm," he said. "A lot of those customers are very specific in applications or have a niche, and may have their own branded products." He said Trostel's $70 million in annual revenues are split fairly equally between molding and mixing. Most of the investments in Reynosa primarily have been around equipment upgrades, Dyer said, migrating toward more injection presses and filling out technologies. Vassmer said Trostel has been looking to move from larger-scale presses to smaller ones at the 66,000-sq.-ft. Mexican facility. "It's a part of the strategy to get to lower lot sizes and lower batch sizes," he said. A focus also is on lean manufacturing initiatives to accelerate innovation and efficiency. "We really feel we have what is just a world class management team there with a lot of external worldly process-driven experience," Dyer said. He added that the Reynosa plant has single-digit external part per million rejection record, has 98-plus percent on-time shipping and is responsive in solving customer problems. "Our customers always walk away from there feeling confident about the processes that are deployed to run their products on a daily basis," Dyer said.